Hair Of The Dog | Beer Apprentice - Craft Beer News, Reviews, Interviews and Info. Review of Hair Of The Dog "Fred"
Hi guys. 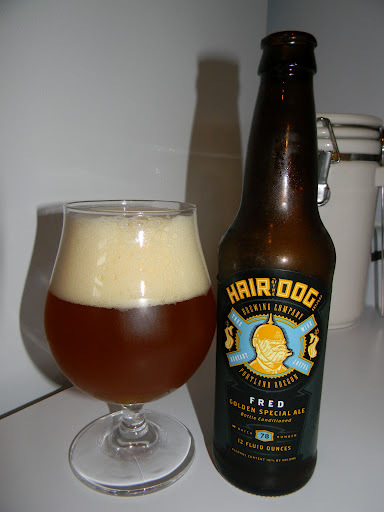 For today’s craft beer review I’m going to be trying the Hair Of The Dog “Fred” produced by the Hair Of The Dog Brewing Company located in Portland, Oregon. This is not a brewer that I can normally find in my area, so I really lucked out when I saw this single bottle in a shop in Southern Indiana. I’ve heard many great things and I’m really looking forward to trying something from this company. From the website, hairofthedog.com, we find this description of the “Fred”. Fred was created to honor beer writer and historian Fred Eckhardt. Fred is a big inspiration for me and many other brewers. Fred’s work in all-grain brewing and beer styles helped me become a better brewer. Fred the beer is a deep golden color. It is made with aromatic and rye malts and includes 10 different hop varieties in an effort to incorporate the whole world into this beer. It has 10% alcohol by volume and 65 IBUs. We hope that Fred will inspire you to share your knowledge with others as Fred has with us. This brew comes in a 12 oz. bottle and it has an ABV of 10.0%. “Fred” poured a hazy, deep golden to orange color with a slightly off white head that was very fluffy, soft, rocky and mostly creamy. The size was enormous from a medium aggressive pour and the retention time was magnificent. The lacing looked great too. Once the head finally did settle it retained a smooth skim of film right on top of the liquid for the duration of the drink. Truly, an awesome looking beer. The brew smelled very sweet. Candy”ish” even. Tons of caramel malt, toffee, hints of tropical fruit, some alcohol and bits of fresh corn silage. An enunciated breadiness really started to shine once the brew began to warm and open up. It was very well balanced, forceful and complex. In a lot of ways this beer conjured up similarities to an American styled barleywine with the abundant amount of malt coalesced with the hops. Overall, the aroma was very, very nice and sturdy I must say. The taste presented an obvious sweet, candy caramel malt. Citrus of orange and mango along with some very light touches of peppery spice. Light stabs of rye bread and Belgian yeast. It had a good hop bite, although the bitterness seemed somewhat restrained in comparison. The alcohol was easily noticed, but it wasn’t overpowering or obstructive. This beer did get sweeter and sweeter as I sipped though. Almost redundantly saturated with sweetness to tell the truth. The mouthfeel was medium to full bodied. Very dry, chewy, warming and sticky. Nearly too sticky to be honest. The carbonation was nice and suitable and a copious amount of flavor was left on the palate long after each sip. No doubt about it, “Fred” is a very good beer. This beer looked and smelled spectacular. It’s quite complex and forceful in the taste, however when taken slowly it’s very manageable. The sweetness was a tad much for my liking, thus making for a drinkability that wasn’t as high as some other Strong Ales that I’ve tried. With that being said, it could very well suit your needs, so give it a try if you can get your hands on it. I would never turn it down that’s for sure and I would love to be able to obtain a couple more Hair Of The Dog brews to see how they stack up against this one. I would be interested to know what you guys think of this beverage if you have tried it, so please leave a comment if you have a moment. Thanks for reading everyone. I, truly, appreciate it.